“Season of Light: A Winter Fairytale” by Steph DeFerie is playing for two weekends at Silver Spring Stage. The play is produced by Maura Suilebhan and directed by Katie Rey Bogdan. 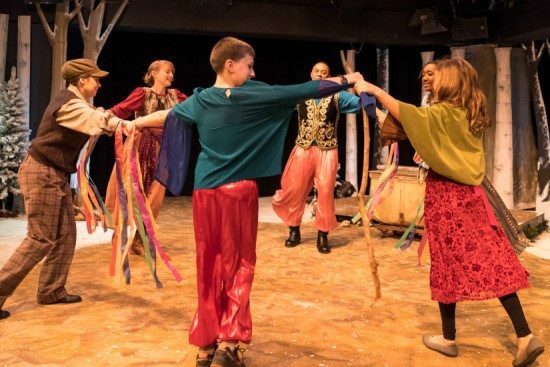 The play opens with the young girl, Magda (Claire Gunthert) getting ready to play a part in the town’s winter solstice pageant. She is apprehensive as is the director of the production (Courtney James). If She the Sun does not like the presentation, the days will continue to get shorter after the winter solstice, eventually having just night. When the crowd turns on Magda as the dawn arrives late, she flees the town to live in the woods. There she finds a troupe of actors, one who is blind but sees the future, one who is deaf, but can hear things others cannot, one who is mute and talks through a handmade flute, and another who has an affinity with the forest animals. They are led and protected by Rodrigo (Carlos Reaves). Tension mounts as the troupe finds out that they must find She of the Sun, and all must go back to the town. There are many twists and turns to the plot, and secrets that are divulged about Magda, her mother (Jacqueline Youm) and Rodrigo. In the end we learn lessons about giving, family and friendship. There is also an underlying theme about why mistreating others based on where they are from is counterproductive. The play was written by DeFerie, at drama teacher, to be produced at the Chatham Middle School by the drama club in Cape Cod, Massachusetts. Therefore, it is not surprising that much of the cast includes of youngsters around middle school age. The children do a fine job playing an assortment of roles as do the adults in the cast. If you are looking for a different holiday story, ‘Season of Light: A Winter Fairytale,’ is perfect for children of all ages, even those who are just young at heart. Gunthert is a very sweet Magda. Her winning smile and enthusiasm light up the stage. Reaves’s Rodrigo, the leader of the wayward thespians, gives a standout performance. At one point his own past is exposed, and Reaves conveys the one face he has to show to the crowd and the other that shows him processing the new information. (I am being vague as I don’t wish to spoil the ending.) Youm also gives a solid performance as Mother. Her interaction with Magda shows her love and concern. The four actors in the trope Cassie Brode as Toot, Rebecca Shoer as Gwendolyn, Zachary Singer as Stephen and Olivia Waymer as Apple all do credible jobs creating their misfit characters. The rest of the fine cast include Asher Howell, Dina Howell, Brynn Krasney, Camden Salguero, James Sherman, Alison Starr, Maeve Thibault, Crystal Wheeler and Anna Yancich. Bogdan’s directing helps convey the morals of the story, and she keeps this group of youngsters on track. The set by Leigh K. Rawls conveys the stark wintertime in a small village in Europe in1585. The evergreens are framed by stark leafless tree trunks, and the stage is painted to give the feeling of snow. Carrie Kirby’s costumes, especially the ones that are animals, were clever and the humans are dressed appropriately for that place and time. Jim Robertson’s lighting design and Jeff Miller’s sound design help to create the bleakness of the season. The nighttime scenes are very effective. If you are looking for a different holiday story, “Season of Light: A Winter Fairytale,” is perfect for children of all ages, even those who are just young at heart. Disclaimer: Susan Brall has been involved in several productions at Silver Spring Stage. This did not affect her review of this production. 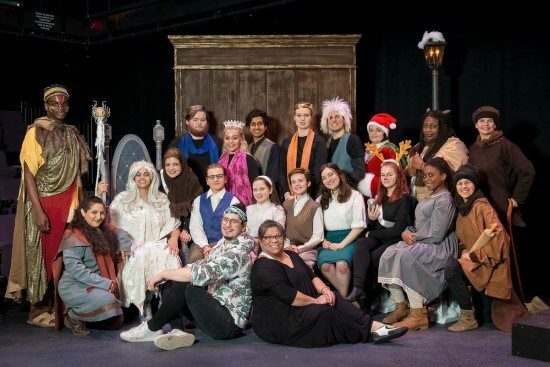 “Season of Light: A Winter Fairytale” plays weekends through December 16, 2018 at Silver Spring Stage –10145 Colesville Road, in Silver Spring, MD, in the Woodmoor Shopping Center. For tickets, purchase them online.